Before last night, Klay Thompson was 5-of-36 from deep on the season. Five three-pointers in 232 minutes, over six games, averages out to about one three every 46 minutes. 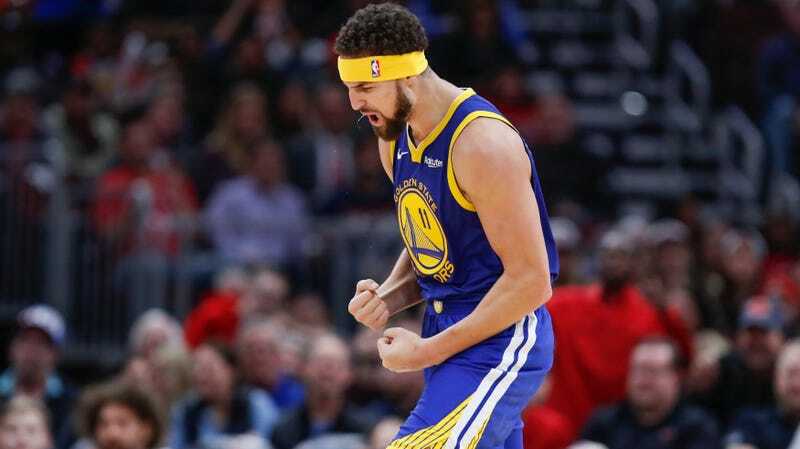 In Monday night’s beatdown of the Chicago Bulls, Thompson shot 14-24 from beyond the arc in 27 minutes, making that one three-pointer every two minutes, and broke Steph Curry’s record for most three-pointers made in a single game. In the first half alone, Thompson drained 10. He broke Curry’s record of 13 with 4:53 left in the third quarter, and he looked like he could’ve kept going, too, but Steve Kerr benched the starters as the game got out of hand. Even a bleeding head wound, thanks to a collision with Warriors center Damian Jones in the third quarter, couldn’t break the rhythm. Nights like these are brutal reminders of just how unstoppable the Warriors are. Thompson is a historically great shooter with a handful of the greatest individual scoring performances in NBA history to his name, and he’s, what, the third best player on this team? The fourth? At this point Curry, Kevin Durant, and Thompson should just take turns going for Wilt Chamberlain’s single-game scoring record every night. They need some sort of challenge.